1. A stone free fall from the height of 45 meters. If the acceleration due to gravity is 10 ms-2, what is the speed of the stone when hits the ground? 4. Two objects, object 1 and object 2, are free fall from a height of h1 and h2 at the same time. If h1 : h2 = 2: 1, what is the ratio of the time interval of the object 1 to the object 2. 5. An object dropped from a height of h above the ground. The final velocity when object hits the ground is 10 m/s. What is the time interval to reach ½ h above the ground. 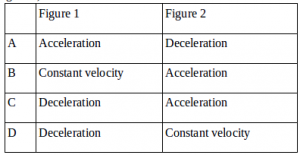 Acceleration due to gravity is 10 m/s2. The free fall motion of coconut (figure 1) and the motion of a ball thrown vertically upward to the highest point by a student (figure 2). Determine the kind of both motions. 7. A stone free fall from a building. The time interval needed by a stone to reach the ground is 3 seconds and acceleration due to gravity is 10 m/s2. Determine the height of the building. 8. A fruit free fall from its tree at the height of 12 m above the ground. If acceleration due to gravity is g = 10 m/s2 and the friction of air ignored, then determine the height of the fruit above the ground after 1 second.